Olympic Fencer Molly Sullivan Sliney has spoken to thousands of students since coming back from the '92 Games in Barcelona, and her message has always been the same: Believe in yourself, set goals, and move towards those goals one step at a time, and your dreams can come true. Molly delivers her message in a clear and interactive style, sharing her many experiences, from growing up suffering with the learning disability dyslexia, to fencing and traveling all over the globe. With over 20 years of speaking experience, she encourages students to pursue their dreams through goal setting and hard work. As of September 2017, Molly has teamed up with world champion epee fencer Arpad Horvath and joined Vivo Fencing Club as a partner and coach. The club has relocated to a 6,000 Sq Feet space in Bradford with 14 electric strips. Vivo is now a two-weapon club offering both Foil and Epee fencing. 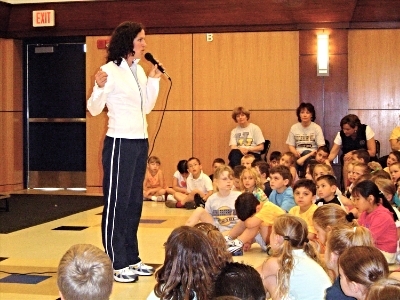 Would you like a two-time Olympian to come visit and speak at your school? Molly's passion, experience and enthusiasm can help make a positive impact. Presentations are for students of all ages, and last approximately 45 minutes. For more information, please call 978-469-0640, or email Molly with any questions you may have.